Some of the teapots I collected and using. Some are mass produced run of the mill type cost HK$100 or so, and some are from master artisans costed thousands of HK$. 漢緣 is a variation of a classic style 漢方. 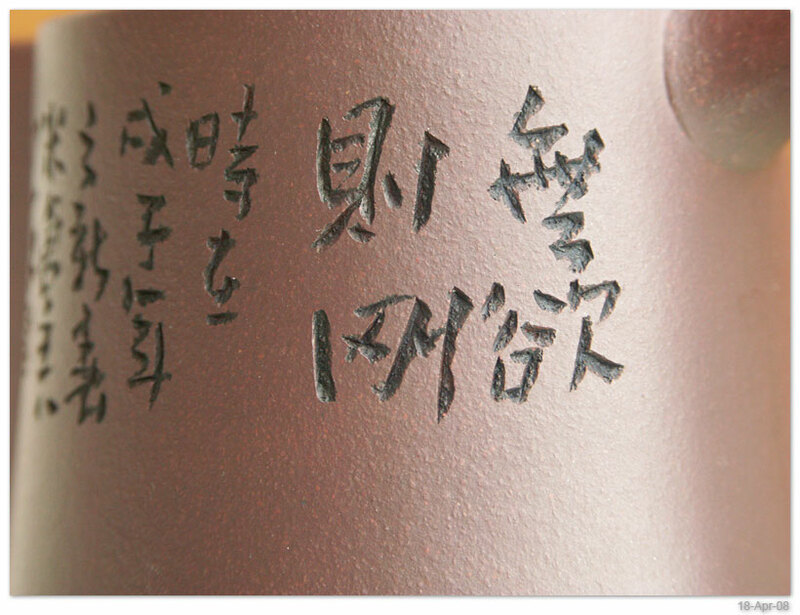 The artisan 開四海 created this few years ago, and decided in late 2008 not to make this design any more. 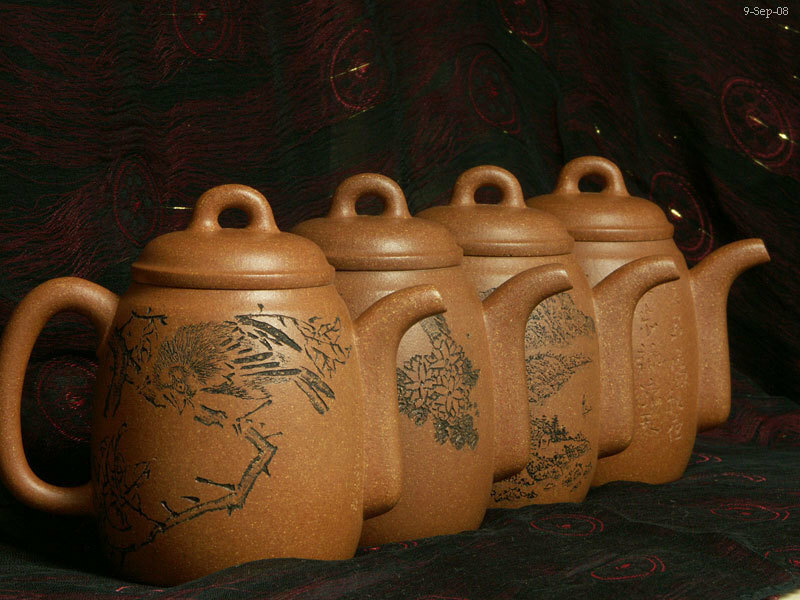 Each pot is hand made but with a mold, or the so called 檔丕. See http://chinman.com/index.php?topic=58.0 #5 & #7. 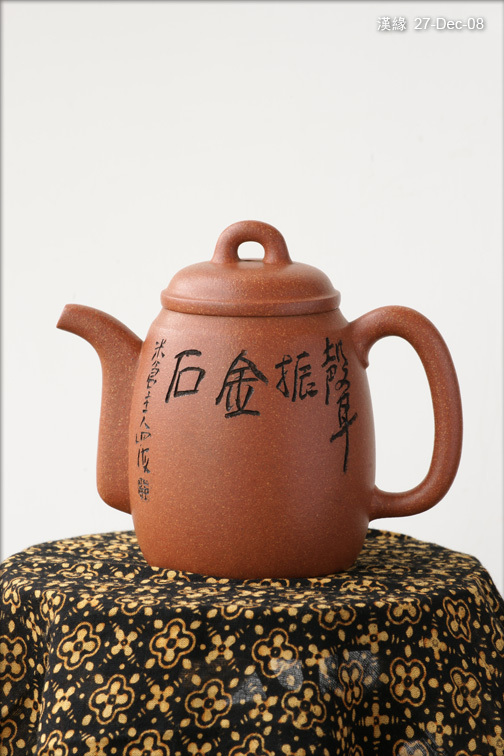 Once the teapot is shaped and dried, but before going to the kiln, 開四海 would write and engrave each pot with different pictures and Chinese phases. 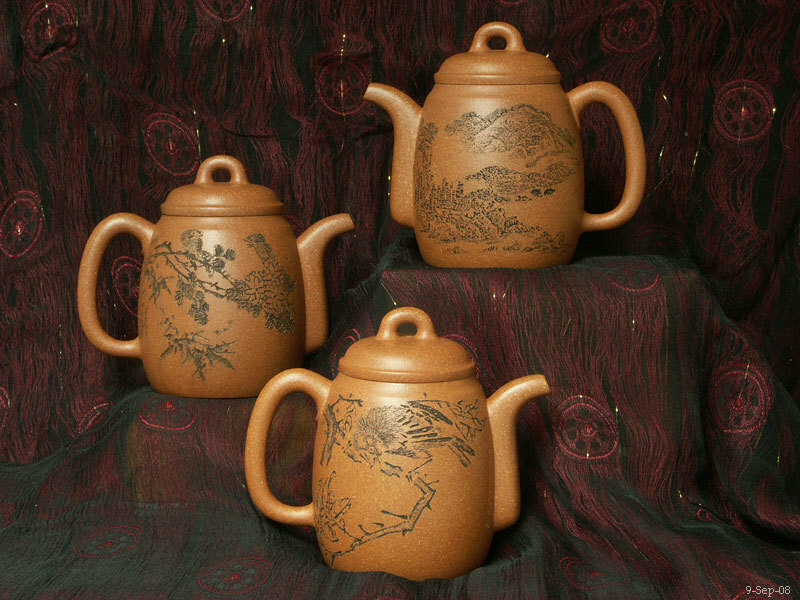 Each teapot takes a few weeks from start to finish, and the artisans would start make 4 to 6 at the same time to save time. 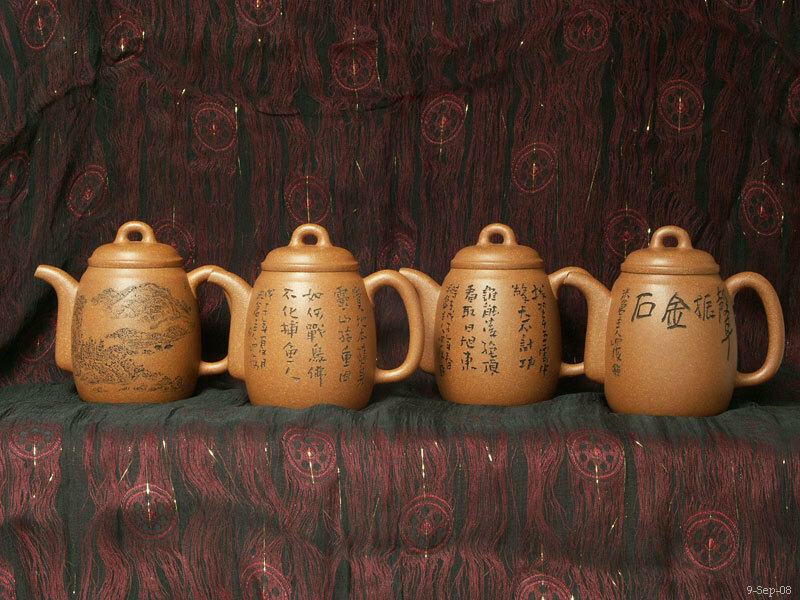 I was told that 開四海 can make about 100 teapots of different style each year. 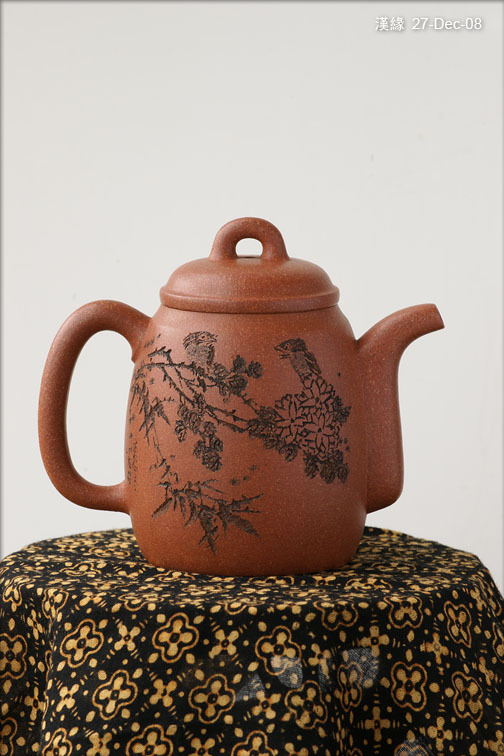 開四海 started his career as a painter, and switch to making teapots after move to Yixing. 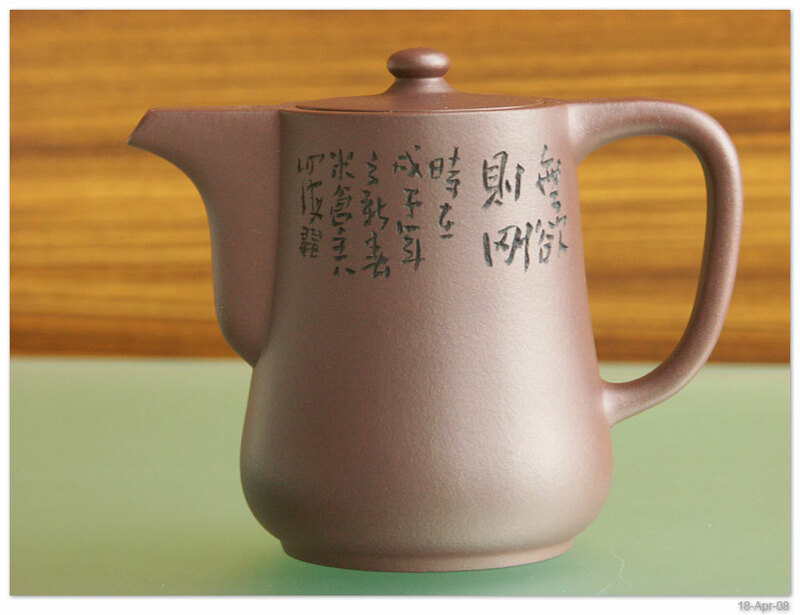 In some sense he was an outsider, as compare to other Zisha artisan who has family history of making Zisha wares like teapots, thus have stable access to the best zisha clays. First picture taken on 8-Mar-08 after I acquired the pot. The following pictures taken in mid-Apr 08. The "certificate" from the pot maker. On 9-Sep-08, a few friends who had this teapot meet up to take the following group pictures. Due to the lighting conditions there, but mostly my lack of technique in proper adjustment, the colours are off by quite a bit. I bought this from a Taiwanese tea web site in 2004 for HK$700. I didn't know anything about the artisan. I liked this pot because it's small (~100cc) and the clay seems to be good quality. Too bad the pot cover edge was very think, and my now chipped a lots. 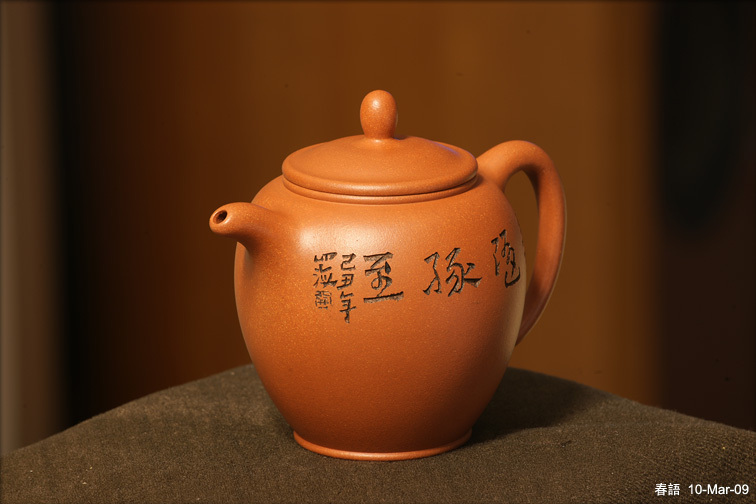 This teapot was used solely to make certain tea - the traditionally baked Tie Guan Yin 焙火鐵觀音. I don't drink this kind of tea much these days and thus not using this teapot much. 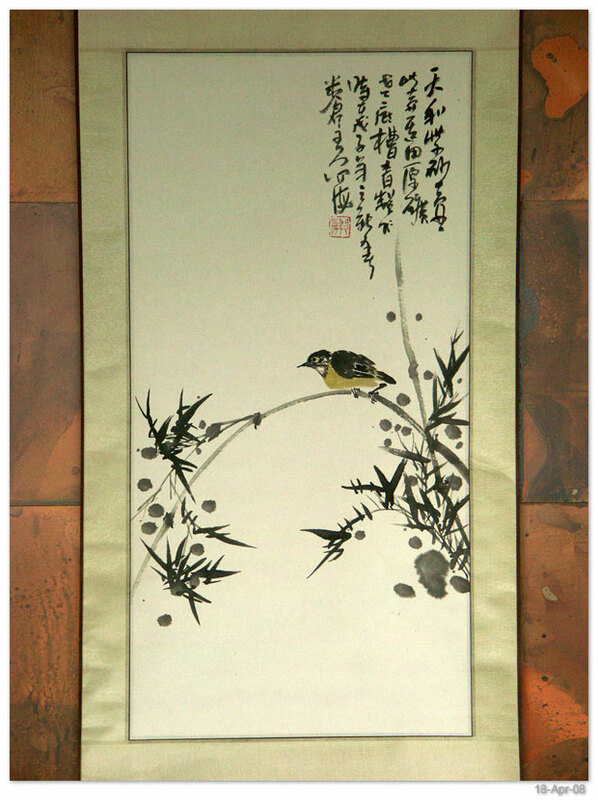 高峰's style and technique has matured much and generated good followings in the market. The last time I check, his new pots would cost thousands. 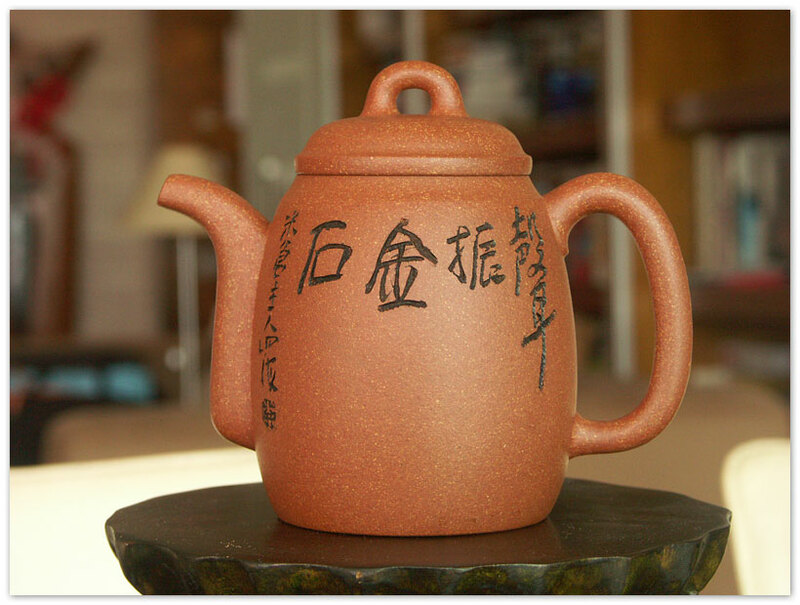 The second 開四海 I bought, originally for my father who wanted a bigger teapot. But once I show this to him, he thought this was too small for him. So now this pot is in my collection. 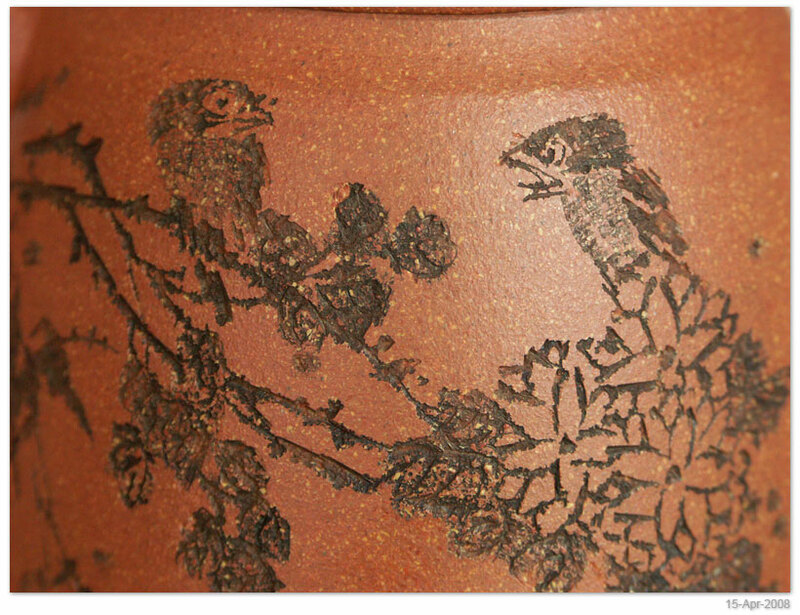 I really liked the Chinese phase engraved on this pot. 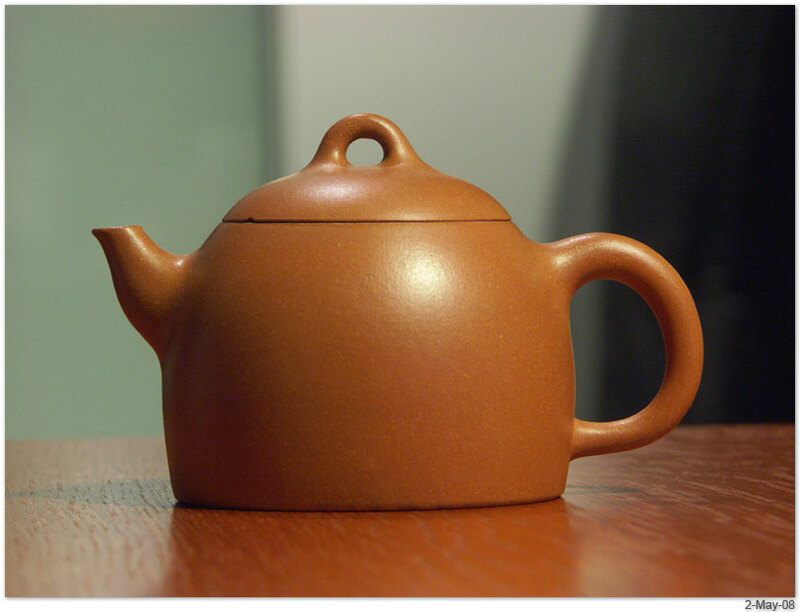 However the shape of the teapot is not very good at allowing the tea leaves to open up. Perhaps good to make tea with smaller tea leaves. 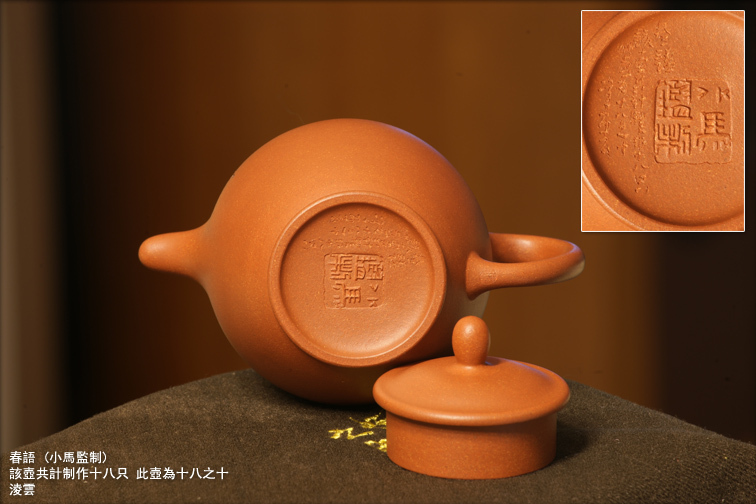 The zisha clay was very good and this pot can really force the tea flavour out (很好的逼茶力). But this pot is a bit too big (~250cc) for my daily use. So now it's in my office and used when I have friends coming over for tea. 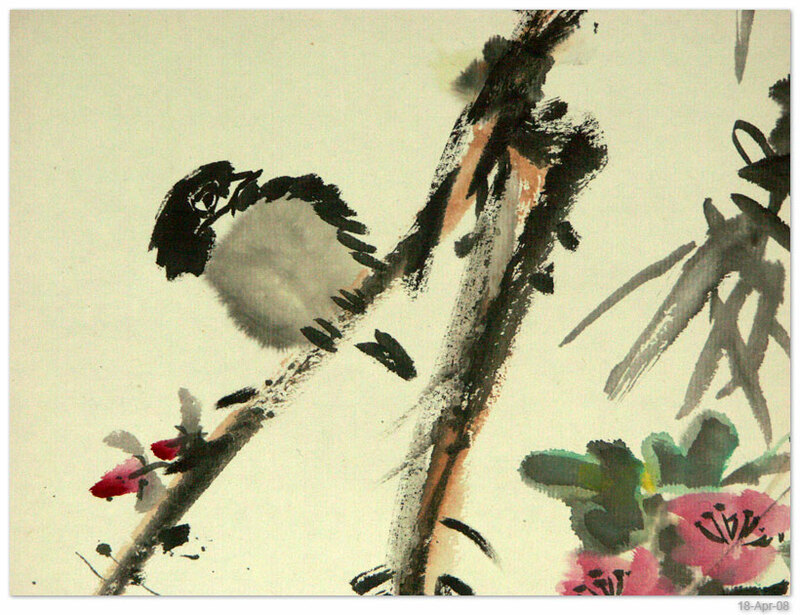 The certificate is another painting by Kai. We visited the shop of Jian Xiang Yu 蔣翔宇 a few times during the trip. I never bought any pot from him before, but heard good thing about him from my friends. 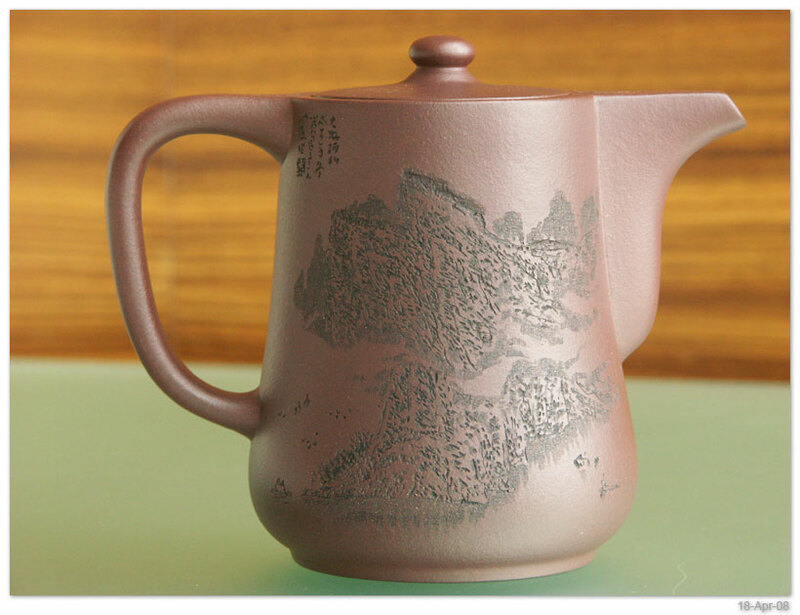 His pots are generally using good quality Zisha clays and priced reasonably at about RMB1300 or so. 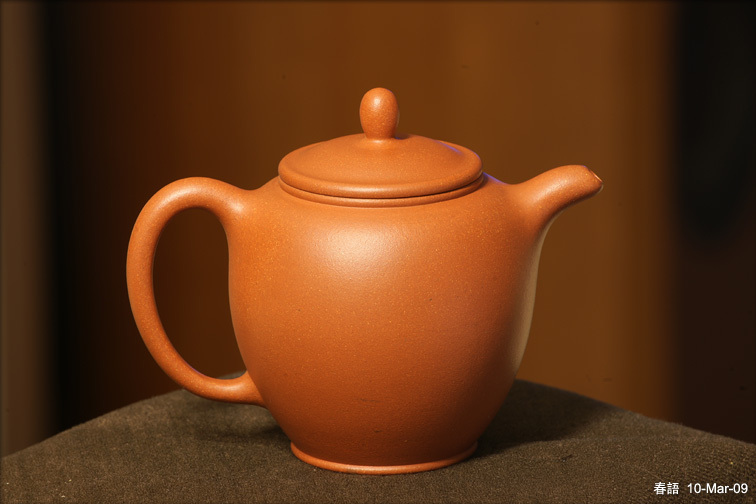 蔣翔宇 no longer make teapots. He uses a few artisans on project basis. 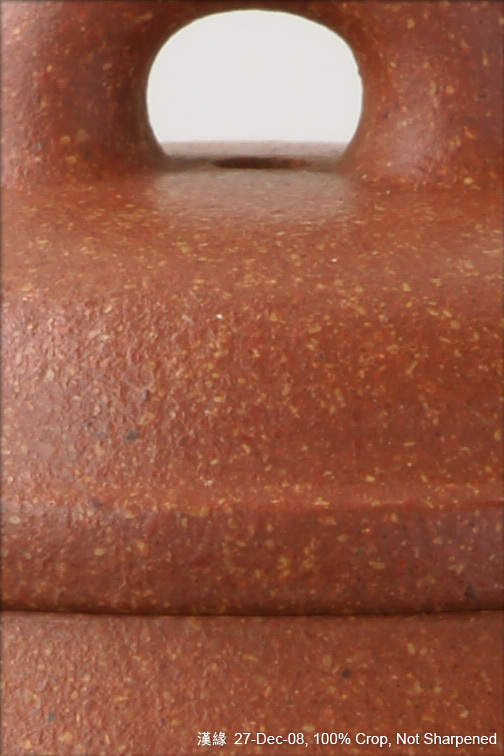 Jiang supplies the material (the Zisha clays), controls the quality and sells the pots. His wife's family is also in the Zisha business. In short he's focused on the more "scalable" size of the business. I bought this pot because it's small enough at about 120cc. 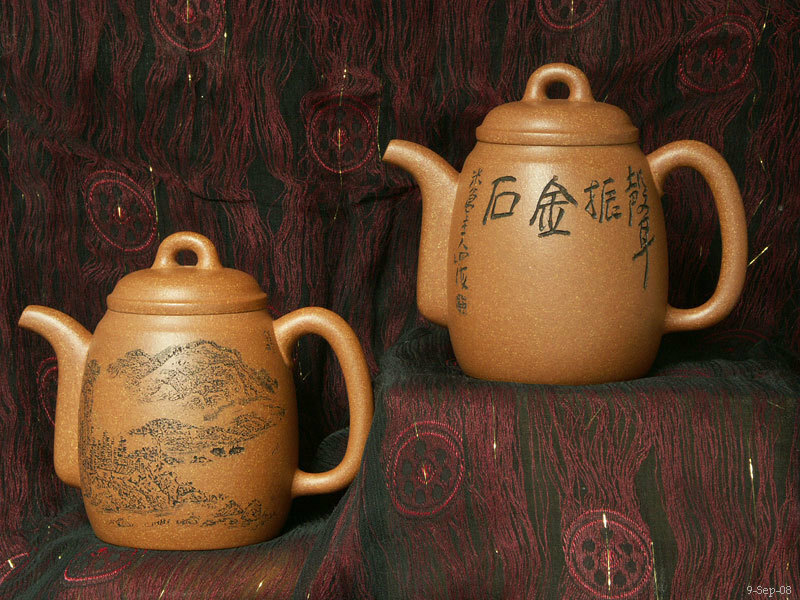 I also have friends who has pots made from the same clay and the effect is very good, especially for making old tea. This design is called 潘壺. 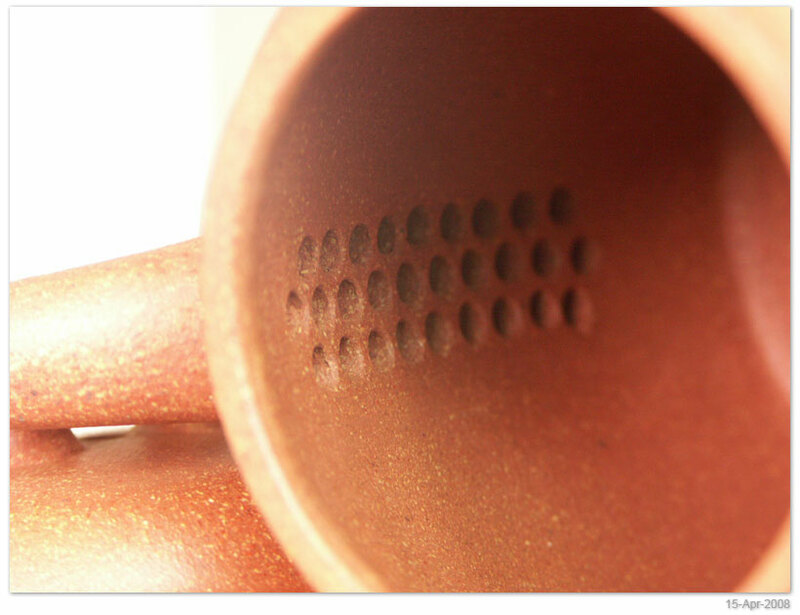 The 3rd pic is the detailed view showing the special characteristics of Zhu Ni (朱泥, Deep Red Clay). 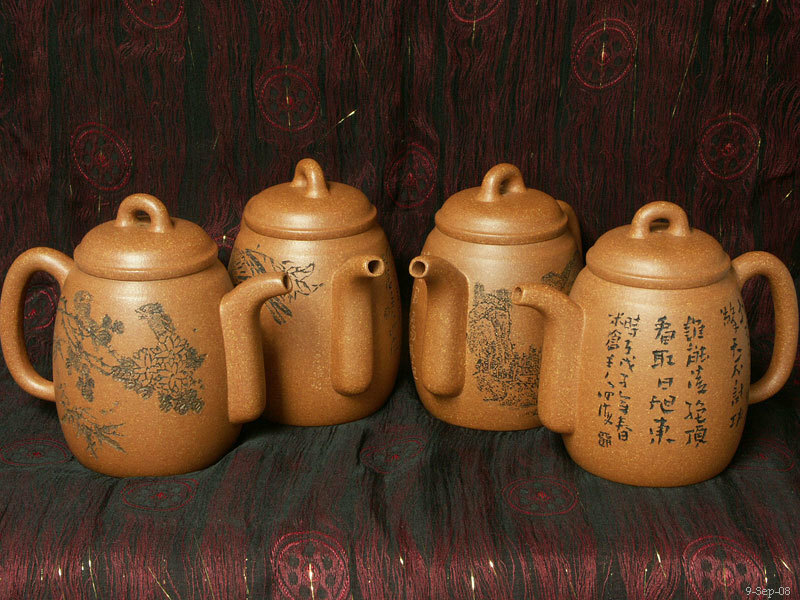 朱泥 has very high iron content, thus pots made from 朱泥 are a bit heavier and able to retain heat very well for making tea. The small irregular shape black dots are the iron residues. 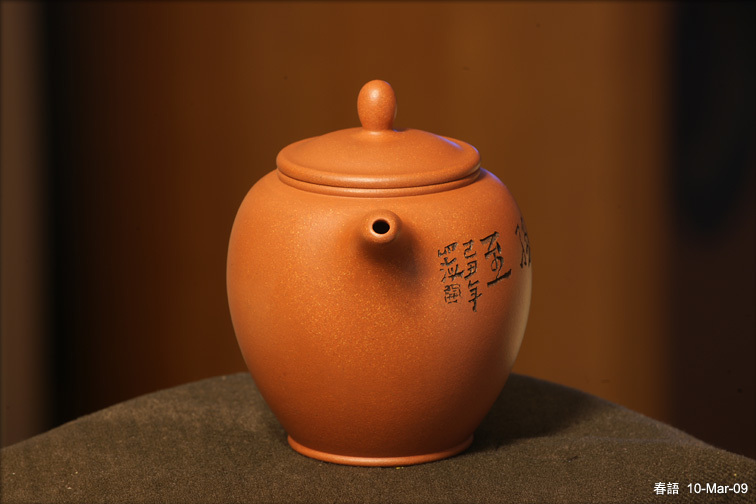 Another characteristics of 朱泥 is its high contraction ratio before and after the kiln - the result of the contraction is the very visible "winkles" on the surface. 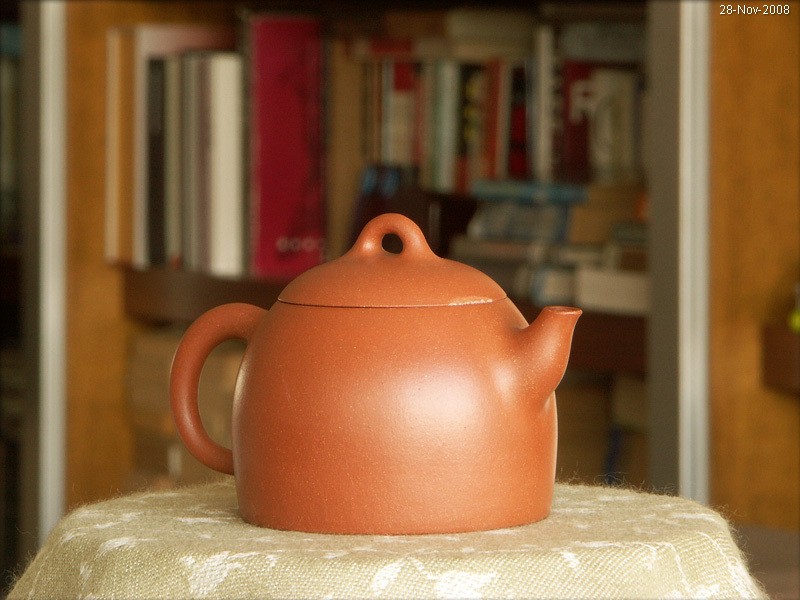 I received this teapot today. 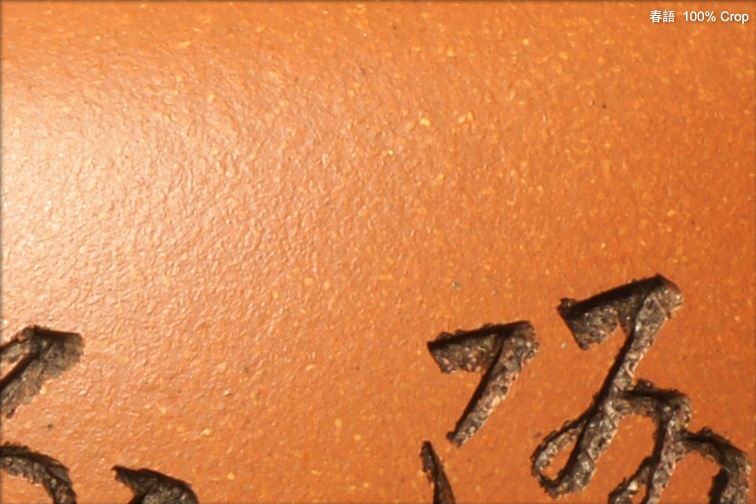 It was a very special gift and a product of collaboration by three Zisha artisans. 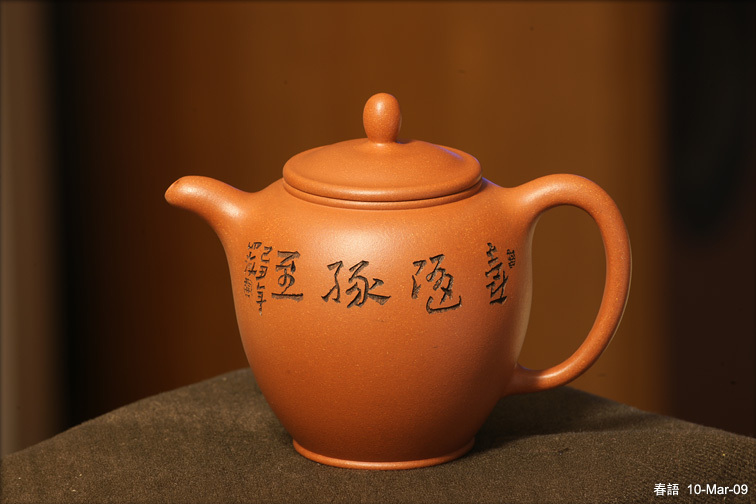 This pot was design and partly made by master Zisha artisan Shi Xiao Ma, caligraphy engraving by Kai Si Hai, and the pot made by Chu Ling Yun. They made only 18 pots and I have no 10. Thomas has no 9. In Nov 08, I got the chance to visit Yixing where Zisha art originated. Kai and his friends were showing us around, demonstrated to us how various part of Zisha teapots were done, and arranged for us to visit the workshop of Shi Xiao Ma. 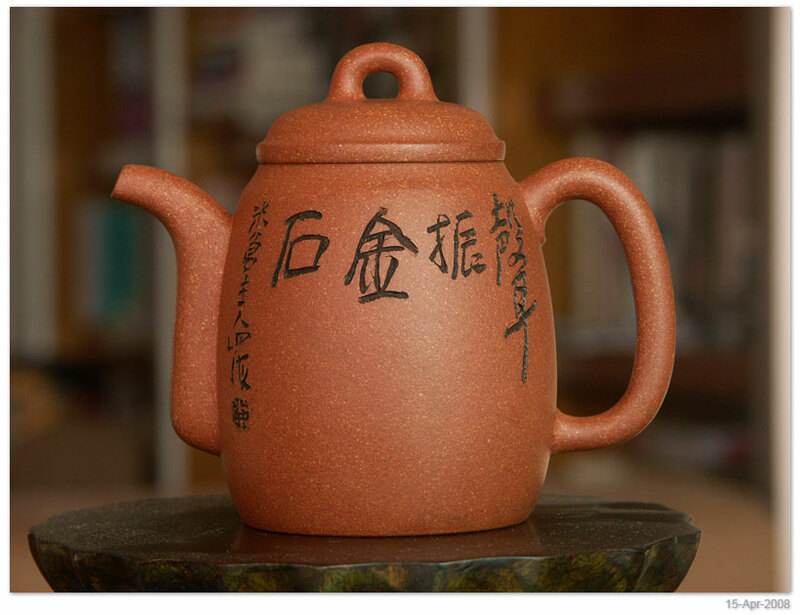 So when we leanrt that Shi and his family, and the Kai couple, is visiting Hong Kong, we arranged the local receiption parties, hotels, transportations, etc... And they have prepared this special teapot as a token of gratitude. Shi, in early 50 now, is a third generation Zisha artisan. He's a very well know and respected master artisan now, famous for his square designs, no nonsense approach, and insistence on doing everything himself (instead of farming out part of the works to other people, or worse selling his name as a brand.) 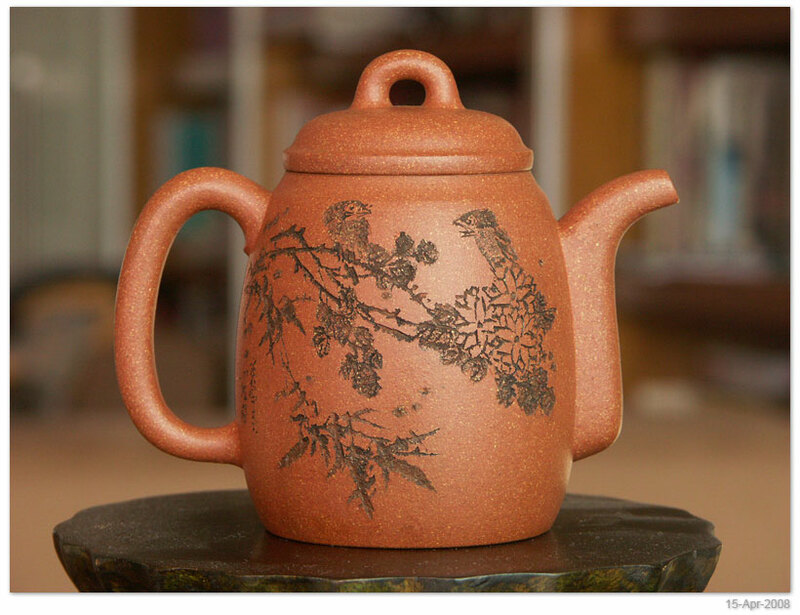 I do not have any pot by Shi partly because I prefer practical small teapots around 100-150cc but most master artisans are only making large 300+ cc teapots. 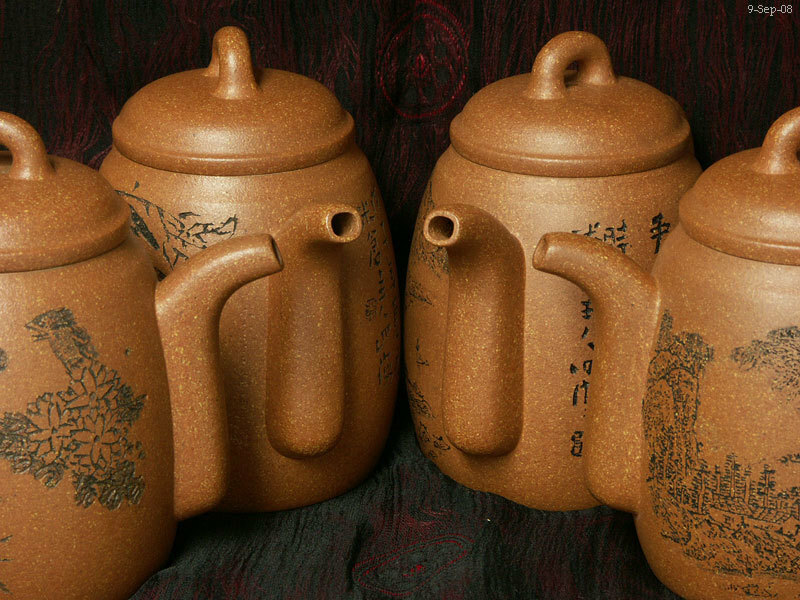 Also Shi's teapots are now priced at tens of thousands RMB. 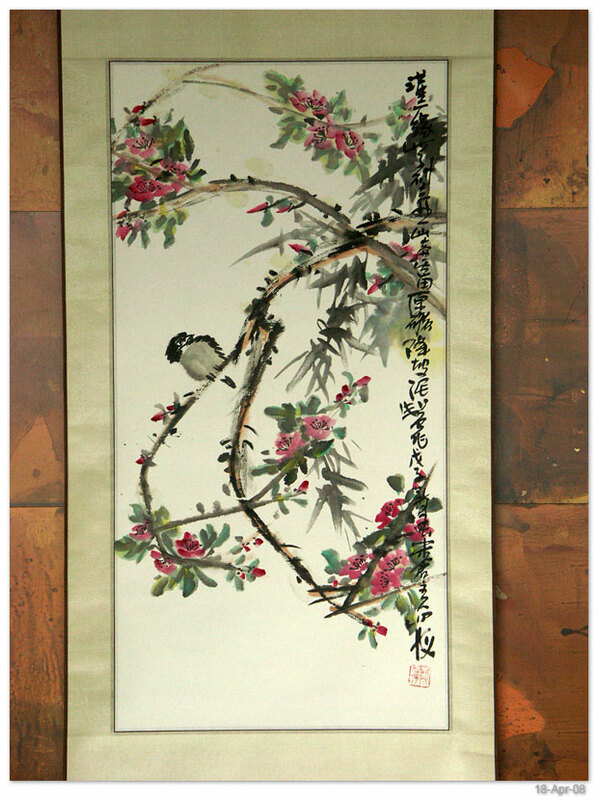 Kai was trained in caligraphy and Chinese painting. He moved to Yixing in mid-90s and started to develop his own style very well in the last few years. I have a few of his teapots. 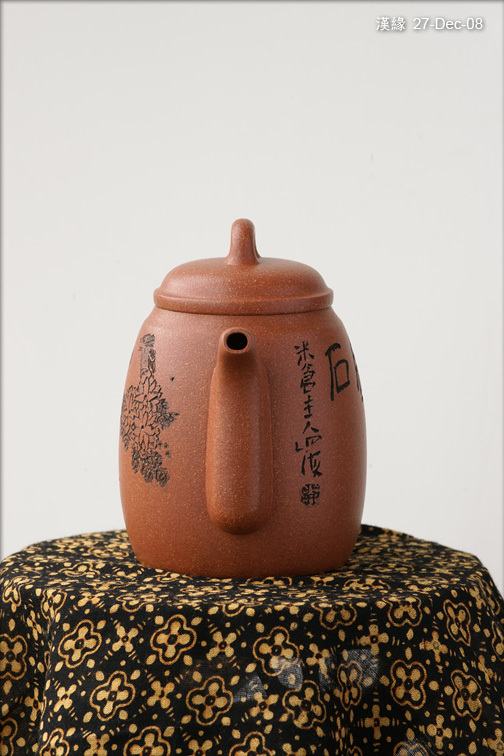 Chu Lin Yun is his wife and an excellent Zisha artisan in her own right. The Spring Whisper is a very nice teapot not only as a memory of the occasion, but also for its very practical design, and fine craftmanship. I have not updated the pictures here for a long time. The price of nice pots like the above had gone through the roof and more than doubled in the last 3 years or so. 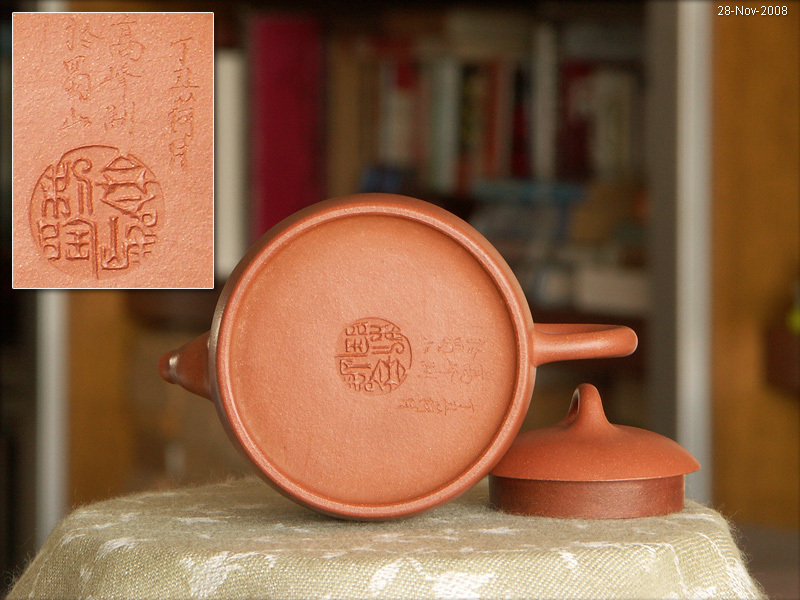 Anyway, I ordered a set of 原礦紫砂壺 from tea forum, and these are 2 of the 4 in the set. Cost for the whole set RMB1800. The pictures are taken with a small digicam, so quality is not so good. To illustrate the scale, the poker chips on the side is 39mm in diameter.